Wessex delighted show-goers at the Grand Designs Live, London Excel last week. The beautiful, pet-friendly Wessex Allure luxury lodge was on show. Located next to the Grand Theatre, the Allure was perfectly positioned to draw in the crowds and proved to be a real showstopper! Is the Allure Pet Friendly? Pet friendly accommodation is growing in popularity and according to holiday bookings operator Hoseasons,. It now accounts for 24% of the domestic, self-catering market. For many years, pet owners have felt excluded. Often they are allocated the oldest accommodation on-site due to the wear and tear pets can cause. Howevert, there has been a noticeable change. Park operators are now embracing the pet friendly market, offering quality accommodation for all. The Wessex Allure luxury lodge takes this demand one step further; a lodge where pets aren’t just welcome, they’re catered for! 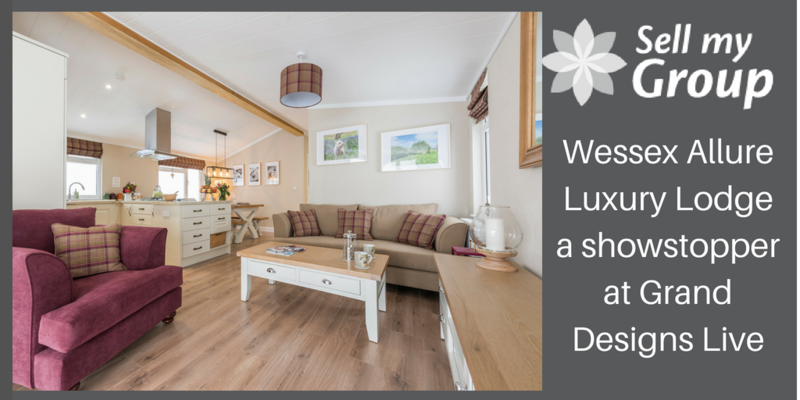 The Wessex Allure isn’t just about pets though, it’s a distinctive stylish lodge with a wonderful warm and cosy feel, a real home from home. The striking exterior, clad in beautiful larch has a split-level roofline. This is highlighted by feature lighting in the extended front soffit. Full-height windows to the snug and master bedroom. There are two sets of bi-fold doors to the lounge accentuate the distinctive, architectural styling to complete the look. On entering through a welcoming, country-style front door, all family members are catered for. There’s a large boot seat with wicker storage baskets. A mirror with coat hooks, the washing machine is conveniently tucked out of the way here and there’s also a dog shower! Dirty paws tattraipse through into the main living space eradicated, However, there is a practical choice of laminate flooring in a forgiving warm wood finish. The spacious lounge is light and bright thanks to two sets of bi-fold doors. The doors are a fantastic feature for making the most of a view and to extend the living space outside on a warm summer’s day or evening. There’s a large comfortable sofa and two cosy armchairs to sink into here and white painted country style furniture with lime-washed tops provides plenty of storage. Next to the kitchen, a white, country-style extending dining table and benches with lime-washed tops is over-lit by a super-stylish, designer box pendant light. A lovely relaxed space to wile away the hours over a hearty meal and a glass of wine or two! Through into the master bedroom and there’s a waxed oak king-size bed, bedside cabinets, chest of drawers, freestanding wardrobes and a large mirror. A pavilion style fuschia upholstered chair sits next to full-height triple panel windows to make this a room with a view. With beautiful feature wallpaper in soft, soothing tones, compliments the colour-way that flows through from the main living area. Next stop on the show calendar is The World of Park & Leisure Homes Show, Stoneleigh Park Warwickshire, open to the trade on 7th June and to the general public 8th to 10th June (free entry and parking) – Wessex will be launching an all-new luxury lodge, the Spinney, so don’t miss it! 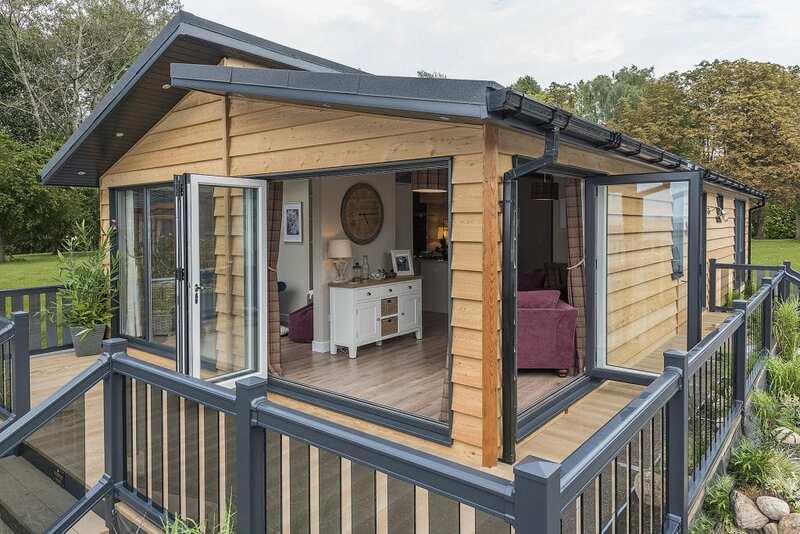 For more information on the Wessex Allure or the rest of the Wessex range of luxury lodges and park homes, please the call the friendly Wessex team on 0845 257 0400 or email sales@wessexparkhomes.co.uk.